" May fond memories keep her close to your hearts." "My condolences to your family for your loss. I remember the..."
"Mrs. Dolores...an incredible person with a lovely family...."
"WE are so very sorry for your loss. Prayers to all of..."
Dolores Badeaux Roussel, a native of Garyville and longtime resident of Dutchtown, passed away peacefully surrounded by her family on Monday, February 11, 2019. Her 90 years were a rich combination of family, work and service. She was a devoted wife, a compassionate mother and a steadfast daughter and sister. Her abundant generosity extended far beyond her immediate and extended families to every human soul who crossed her path or entered her home. After her retirement from Stebbins Lumber and Supply Company (30 years) as a bookkeeper, she began a second career at WYMAR Federal Credit Union (39 years) from which she retired at the age of 85. She also devoted her time and gifts in service of her church community. 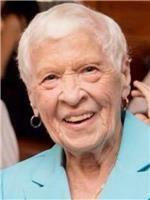 She was a faithful parishioner and the volunteer office administrator of St. John Catholic Church for many years. She was a member of the Lady's Altar Society, the St. John Mission Ministry, the RCIA program, prison ministry and others touching all aspects of parish life. Dolores is survived by her sisters Mary Badeaux Roussel, Nelwyn Badeaux Mancuso and Carolyn Badeaux Rome; son Lewis Roussel, Jr. (Monica); daughters Rhonda McGrew, Tina Sergent (Jeff), Lisa LeBouef (Willie); 10 grandchildren and 19 great grandchildren. She is preceded in death by her husband, Lewis E. Roussel, Sr.; parents, Nolan J. Badeaux and Mabel Duhon Badeaux; siblings, Nolan Badeaux, Jr., Alden Badeaux, Ray Badeaux, Fay Badeaux Kilburn and son-in-law, Leon McGrew. Visitation will be held on Wednesday, February 13th at Ourso Funeral Home in Gonzales from 5:00 pm until 9:00 pm with a Rosary by the St. John Ladies' Altar Society at 7:00 pm. Visitation will resume on Thursday, February 14th at St. John the Evangelist Catholic Church in Prairieville from 9:15 am until the Mass of Christian Burial at 11:00 am. Entombment will follow at Hope Haven Garden of Memory Mausoleum in Prairieville. Willie LeBouef III, Jeffrey Sergent, David LeBouef, Will LeBouef, Adam Jolissaint, Trey Roussel, Caleb Bennett, and Aidan Cole will serve as pallbearers. The family would like to extend a special thanks to all family, friends, and medical staff who offered care and compassion to Dolores during her lifetime. In lieu for flowers, donations may be made in Dolores' honor to the St. John the Evangelist Catholic Church Help Fund. To offer condolences to the family, please visit www.oursofh.com . Ourso Funeral Home of Gonzales is in charge of arrangements.